The Compulsive Reader: The Butterfly Clues Contest! I'm kicking off February with a contest for a book I am very, very excited about! "Penelope (Lo) Marin has always loved to collect beautiful things. Her dad's consulting job means she's grown up moving from one rundown city to the next, and she's learned to cope by collecting (sometimes even stealing) quirky trinkets and souvenirs in each new place--possessions that allow her to feel at least some semblance of home. As she attempts to piece together the mysterious "butterfly clues," with the unlikely help of a street artist named Flynt, Lo quickly finds herself caught up in a seedy, violent underworld much closer to home than she ever imagined--a world, she'll ultimately discover, that could hold the key to her brother's tragic death." A lot of things that main character Lo collects are found in flea markets, which can be interesting places. They hold a myriad of objects with their own stories and pasts, and there's always so much going on in them. What's the most interesting thing you've seen or found in a flea market (or antique shop, etc.)? If you haven't found something cool at a flea market, what's one thing you'd look for while browsing? Comment below and let me know--I'll enter you for a chance to win a signed copy of The Butterfly Clues, courtesy of Paper Lantern Lit! 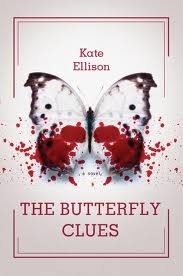 The Butterfly Clues will be out on February 14th--the same day that the winner will be announced! Bonus entries to anyone who tweets/Facebooks/blogs about the contest! U.S. only, please. My husband and I have always said "Always, Forever, No Matter What." I'm not sure where we came up with it, but it's just something we've always said. Well, we were in a flea market a while back and there in the corner sat an old wooden sign with the words "Always, Forever, No Matter What" printed on it. It was something we definitely had to purchase! When I was little, I lived really close to the Pickering Flea Market (which was the largest flea market in North America). My parents let me choose a toy everytime we went and one time, I bought a GIANT magnet attached to a green stick. It even came with a big warning label on it about not placing it on appliances. To this day I have no idea what to do with it or why I chose it. I don't usually browse flea markets, but I once saw this beautiful piece of old bark with the words to a Robert Frost poem carved into it. So beautiful and meaningful, I wondered who carved it, why, and why the bark from that tree? Did he or she kiss the one they loved there? Was that tree their childhood hangout? I loved it! When we were travelling during the summer on a short trip through a few states, we stopped at a flea market which was unique. I managed to pick up an unusual bracelet which was lightweight and composed of an unusual and appealing material. A flea market in town always has interesting items. I could not resist buying an old sign which was very nostalgic and from the 50's, An Orange Crush wooden sign I treasure since it reminds me of simpler times. Thanks for the summary! I had heard of this book but I wasn't sure what it was about. This is so cool! I once found a cool print of a Victorian lady reading in an antique shop. It was only $10, so I bought it and hung it in my room. I haven't went to a flea market in a long time. The last one I went to I think was about a year ago! I don't think i bought anything though. I'm not really into antique pieces. Thank you for the giveaway! Hope I win! I always look for books when I'm flea marketing. I love looking at the jewelery in flea markets. Sometimes you can find a treasure. I bought a beautiful filigree necklace one time. Besides books, I look for furniture. I found a nice bookcase at Goodwill a few months ago and would love to find more. I also look for shelving, you never know what you will find! I love the jewelry that booths have at flea markets. A lot of times there are handmade pieces that are unique to the seller themselves. It's always nice to have pieces of jewelry that you know no one else will have. This sounds like such an interesting book! I love the cover. Great giveaway! I'm so excited for this book. I haven't really gotten so many interesting things from flea markets; but i'm always on the lookout for interesting art or posters to hang in my room. I always look for cool costume jewelry and vintage silk scaarves--the old designs are way cooler than what you can buy new now. Thanks! Oh my god, this looks ammmmmaaaazing! I want it! I don't really shop at flea markets or anything like that, and I hate antique stores, but I like boutiques and I am super into fashion, so that's what I shop for. My email is msparks2013@gmail.com, thank you, I hope I win! I am always on the lookout for birdcages and birds not real ones..Tks for having this giveaway..
God I love the look of this book! Thanks for the contest! This sounds like a good book I LOVE flea markets!!! I have a set of elephant callers.... lol I bought them at a flea market. I thought they were very unusual. They look like, and my be those huge organ pipes. However elephant callers sounds much more interesting so I am just sticking to it. Went to a Paris flea market and was told I could bargan,but quickly found out..THEY DONT BARGAN! It has been years since I went to a flea market!I love them, but the only one here is miles away and I always forget about it.The most interesting thing I ever bought, way back when, was a beautiful bracelet. The metal was uniquely put together. I bought it over twenty years ago and don't have it anymore. Such a pity. I always am on the lookout for books. Old, new, it doesn't matter. The most interesting thing I have ever found was not at a flea market or antique shop, but at a home auction. It was a book of very old cookbooks, including a copy of "The White House Cookbook" published in 1900. In addition to recipes with strange measurements (a wineglassful, etc. ), it contains interesting home remedies (how to clean lace, making soap, cleaning marble), how to set a place setting for formal dinners (many more glasses and silverware than I would have imagined) and menus for a luncheon to serve 1000. It is an adventure trying some of these recipes and remedies but some are quite rewarding. I once bought an old book of hyms at an antique store. My best find was an old stained glass window. It was absolutely beautiful. I didn't buy it, but without my knowledge my daughter did. It was the best Christmas present...and I cherish it til this day! At an antique store a few years ago I found a gorgeous blue crystal decanter with four stemmed glasses. I think it's supposed to be for brandy, but I don't know for sure. Anyway, it caught my eye and I bought it. I have in the past (and would like to continue) looked for old fashioned valentine cards. I like to imagine the stories that go along with each one as I frame them or put them in scrapbooks.